BTN is often asked “where is the best place for a 4/5-night trip combining sea, sand and some good weather. It is impossible to answer of course with one destination but editor-in-chief Malcolm Ginsberg and wife managed to slip away for a few days to a very sunny island, less than 4hr by air from London, and where they had never been before. Since time immemorial, Cyprus has been the junction of the world. Nothing has really changed, although aviation has brought everyone somewhat closer together. Today, with a lack of peace around the Middle East and trouble always seemingly brewing in the Balkans and Russia, it continues as a major crossroad for the region, a gateway to and from Europe. 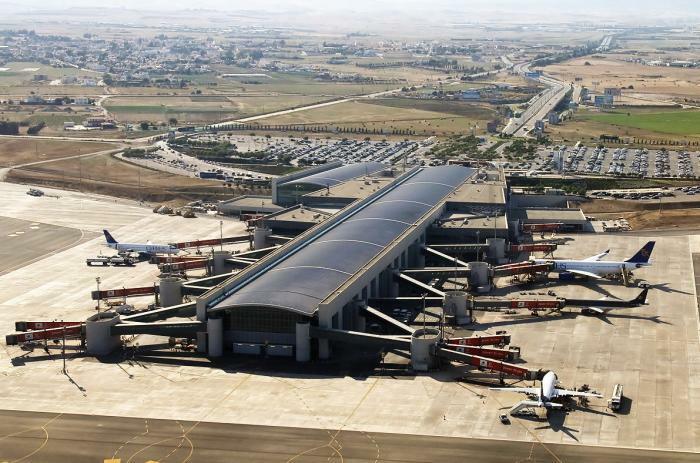 Larnaca Airport, the main airport, which came into existence only in 1974, continues to boom, both as the major entry point for the Greek part of the island and a connector for Israel and states that do not officially recognise it. The failure of both Cyprus Airlines and in recent days Cobalt must question whether the island needs its own air carrier, with Aegean serving as the local airline and the low-cost carriers coming in from all over Europe. The airport is modern, with the latest technological input for immigration and customs and the car hire collection straight outside the terminal. They drive on the left and the Euro is the currency. Virtually everyone has a smattering of English. In 1878, Great Britain succeeded in annexing the island from the Ottoman Empire and in 1960, the Republic of Cyprus was born. A Turkish invasion of the north-east area in 1974 displaced a large number of Greek Cypriots and established a country North Cyprus, that nobody recognises except Turkey. Today, the Republic of Cyprus is part of the EU and the British Commonwealth and is recognised internationally. Turkish Cyprus is a pariah state although in more recent times there has been a warming of relations between the communities and travelling between the two regions, with the right paperwork, is relatively easy. Britain retains two sovereign bases at RAF Akrotiri and Dhekelia in the Greek Cypriot domain. We stayed at the 4-star E Hotel Spa and Resort, in the village of Pervolia. It proved to be an excellent choice, just six miles and 12min from the airport, with a beach across the road and offering its own swimming pool in the landscaped gardens. We were provided with a garden villa which had its own dip pool and Jacuzzi. There is a fine conference centre within the grounds with separate access from the road. Just across the road from the hotel and by the famous Faros lighthouse is the popular Dipato restaurant, also called “Art Café”. Sitting on top of the cliff, and serving typical Greek cuisine and a friendly atmosphere, it opens at noon, and has a large parking area attracting customers from a wide area. 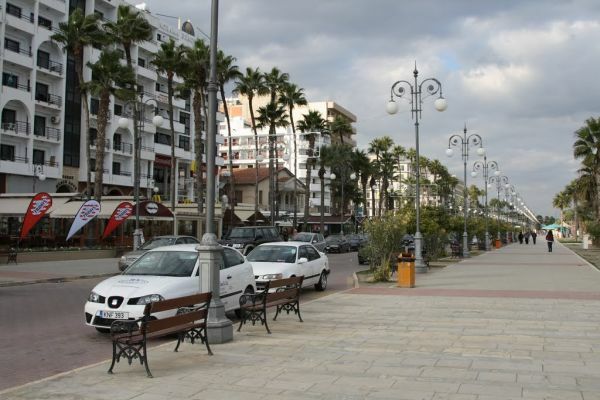 Larnaca is a fast-developing town with a host of restaurant and some fine beaches. If you hire a car, make sure it is a small one. Parking is relatively easy, particularly in the evening, with a number of multi-storey garages and street spaces. 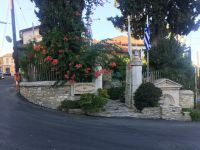 The promenade, Athinon Avenue, runs north to south for over 2km and is a simple bypass for the multitude of narrow streets and passageways that make up the town. There is a fine sandy beach on one side with a newly-built pedestrian walkway, and restaurant after restaurant opposite. Returning north is not that easy and finding a route that works can be a bit of a strain. The signposting could be improved. Halfway along the front is what is termed The Fort, officially the Larnaca Municipal Council Centre. The Medieval Museum is situated on the top floor and exhibits include artefacts discovered in the Hala Sultan Tekkesi area, as well as Ancient Kition. There are also exceptional views of the city and coastline. We ate at two diners, Bolivar and Militzis, virtually next door to each other on the stretch called Pigiale Pasa. The first named is more fine dining and an accepted late-night drinking establishment, while Militzis is huge, very traditional and popular, with Peter Andre a low-key customer with his wife Mrs G about the only person to recognise him. The restaurant is good value and a friendly service. At the northern end of town, and a 20min walk, in a fast-developing former dock warehouse area, the brand new Radisson Blu will clearly match the standards of the franchise. It has had a soft opening with a full reception due this Wednesday, 23 October. Breakfast only. There is a lovely bar on the 16th floor and a superb reception room with a wonderful view across the bay. Opening on the day we visited on the ground floor was a Peruvian restaurant called Marbe, which looked very good. 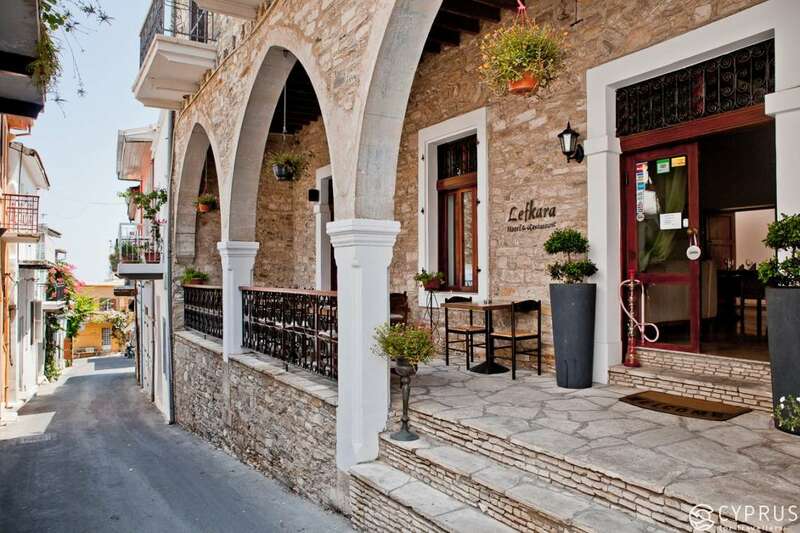 About 30min outside Larnaca is the World Heritage site of Choirocoitia, which means ‘pig-cradle’. 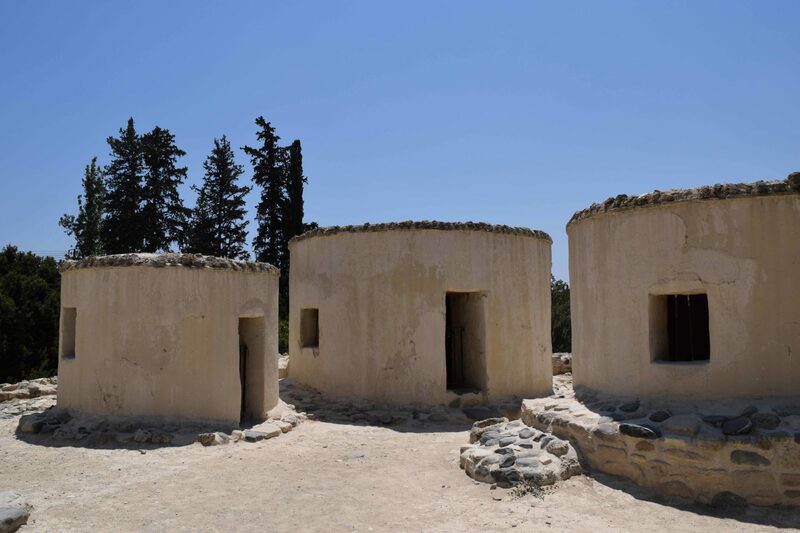 Dating from the Neolithic age, say 6,000BC, it is known as one of the most important and best-preserved prehistoric sites of the eastern Mediterranean. Nestling in a small valley, and carefully rebuilt in recent times, the village houses are crowded together, protected by walls. A household consisted of a compound of several buildings with a circular ground plan around an unroofed space, a kind of small inner ‘courtyard’. These structures were built in stone, pisé and sun-dried mudbrick, or any combination of the three. The roofs are flat and consist of a wooden frame made out of branches, reeds, clay and earth. Excavation revealed the dead were buried in pits inside the dwelling units. Nestling on a hillside 650m above sea level, the little village of Lefkara was part of a fine afternoon drive. A very well-conceived pedestrianisation is being completed at the present time with work progressing quickly. It will be clearly ready for the summer season. Again, no parking problems and plenty of cafés to take in the local drink and patisseries. Lefkara is where the Cypriot folk needlecraft art was born – the famous “lefkaritiko” – which has the reputation which has gone beyond the frontiers of Cyprus and has become known in most European countries. It is said that Leonardo da Vinci came to Cyprus in the late 16th century as a guest of Catherine Cornaro, the queen of Cyprus. He then visited Lefkara and purchased a large big tablecloth embroidered on all sides, which was donated to the Milan Cathedral. Situated at the foot of the Troodos Mountains, Lefkara is not really far from the sea yet is high enough for the moist air coming in from the sea to get dry by the time it reaches the village. This makes it an excellent destination during summer time because of the relatively low humidity from May to October and also the mild temperatures in the region. During our short stay, we strolled around taking a quick look at the Ethnological Museum of Traditional Embroidery and Silversmith-work. The village also has beautiful and ancient chapels, including the church of Timios Stavros (Holy Cross) and the chapel of Archangelos Michail in Kato Lefkara, with frescoes that date from the 12th and 15th centuries. There is a multitude of little shops and we purchased fresh Turkish Delight. I has not been renamed. If it is lace embroidery and filigree silver you want to come home with from Cyprus, this is the place to go. Credit cards and sterling are also welcome. The tourism board catchline sums up Cyprus: “They Always Come Back”. Northern Cyprus is lovely too.